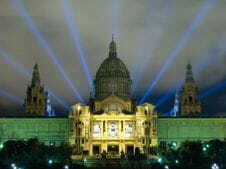 Arrival at Barcelona Airport and transfer to the hotel in a private vehicle. Depending on the time of arrival, the afternoon will be free to visit the city centre. Welcome briefing dinner in the centre. After breakfast int he hotel, we will travel north in the direction of the Pyrenees. Next, we will stop in Vic to have a guided tour of the centre of this historic town. The novelty will be the use of segway. Lunch in a restaurant in the centre of Vic. In the afternoon we will leave for Ripoll to visit one of the best examples of Catalan Romanesque architecture - Ripoll Monastery. After that some free time to walk around the town. Breakfast in the hotel and departure for Núria’s Valley, which is located in the mountains (in winter it is possible to ski here) and for that reason accessible on foot or by mountain train. We will choose the latter. 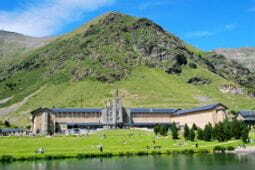 Weather permitting, we will go hiking through the valley and visit a sanctuary situated at an altitude of almost 2 000 meters. We will have lunch in the valley and in the afternoon leave for Queralbs, a typical mountain village with a Romanesque church dating back to the end of 10th century. We will then go to the hotel, which is a renovated typical Catalan farmhouse (masia). Dinner will consist of traditional Catalan cuisine served in the mountains. 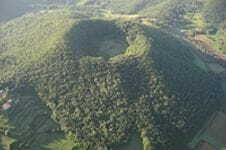 After breakfast we will leave for Natural Park in Garrotxa’s volcanic area to see the most emblematic and outstanding beauty spots: Santa Margarita and Croscat volcanoes, and the beech forest Fageda d’en Jorda. 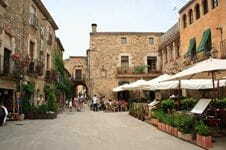 After lunch in a traditional restaurant a visit the medieval town of Santa Pau. An early start of the day to make the most of the weather as it is the day of the balloon flight over the volcanic area. As part of our tradition of christening the flight, we will drink a toast (champagne) and have a taste of local pastries (traditional cake ‘coca’). Once on the ground, we will look back at the flight, share our impressions and have breakfast with the flight team. Next on the list is one of the most beautiful medieval towns in Catalunya- Besalú, which hides real treasures from medieval times, rare jewels on European scale: Jewish ceremonial baths (miqvé). 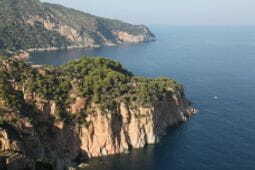 Our last destination is a small marine village - Port de la Selva. 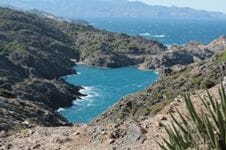 An easy after-lunch trek in the Natural Park Cap de Creus, visiting Dalí’s favourite places. After the meal in the very same park, we will visit a charming village of Cadaqués and the house in which this world-famous artist used to live. 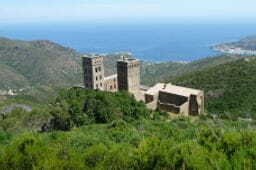 After breakfast, we will visit one of the jewels of Romanesque architecture in Catalunya, the unique and secluded Sant Pere Monastery. 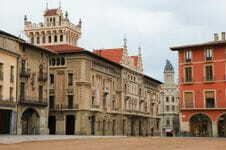 After the visit we will have lunch in the same monastery and then leave for Girona in the afternoon. 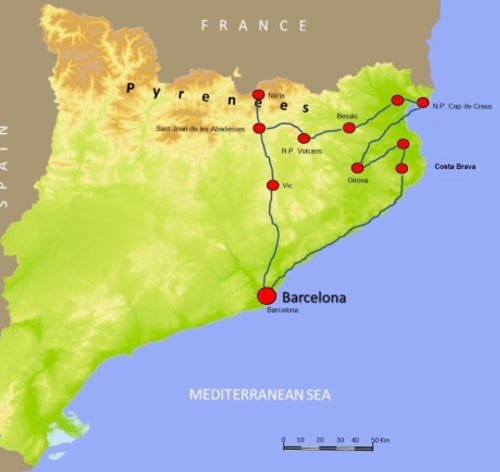 On the way there, we will stop over in a wine cellar (Empordà) to have wine tasting experience. Arrival in Girona. Check-in. The rest of the afternoon free. After breakfast a guided tour of Girona’s most emblematic sights followed by some free time to walk around the city and soak up its atmosphere. 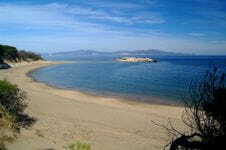 After breakfast we will leave for L’Escala, a marine town. The rest of the day will be free to relax on the beach or go hiking on part of the costal footpath that runs along Costa Brava (camí de ronda). In the afternoon - the opportunity to visit a fish factory in L’Escala, whose marinated anchovies have won international renown. 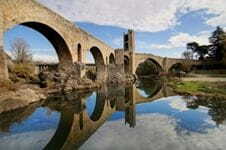 In the morning we will leave for a charming small village of Peratallada, where we will have lunch. 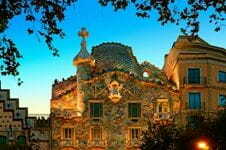 Next, departure for Barcelona to which we should get at about 5 p.m.
Breakfast in the hotel and depending on the time of the return flight, free time in the city. Tranfers to the Barcelona International Airport.